Chemoselective ways of making amines have been and continue to be a special type of craft in organic synthesis. I have heard several people say that adding one nitrogen to a molecule a graduate student is working on adds a year to his/her PhD… I suppose this is why I have a deep admiration for Fukuyama’s seminal studies in nosyl chemistry. We had a group meeting a week or so ago when Frank Lee, a first year graduate student in my lab, put together a problem set dealing with a neat new way of deprotecting mesylates. This reaction comes from an Org. Lett. paper published in 2010 by Urabe and colleagues from the Tokyo Institute of Technology and it involves the N-mesyl functionality. The mesyl group has always been a bit of an outlier. Even the mechanism of mesylation is distinctly different from the one that we teach in the case of tosyl chloride. In Urabe’s case, it turns out that you can (almost) take advantage of the reverse process upon hitting a mesyl-protected amine with a strong base. You need a couple of equivalents of BuLi, along with oxygen sprinkled in between. 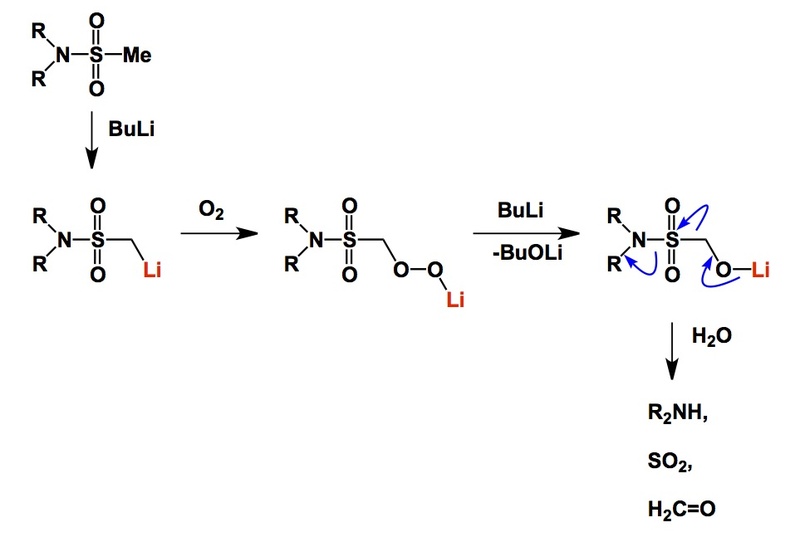 Taken together, these steps offer a really nice base-promoted way of chemoselective removal of the mesyl group. Very significantly, other sulfonyl protectiong groups (such as Ts) survive these conditions because they do not possess acidic hydrogens. I can sense some far-reaching possibilities for chemoselective polyamine synthesis here… Thank you, Frank, for locating this useful paper!